According to The New Stack, over 75 percent of organizations are already using or planning to use serverless in the next 18 months. * From AWS Lambda to Google Cloud Functions to Microsoft Azure Functions and KNative, enterprises have more cloud provider options than ever before when integrating serverless into their application portfolio. Today, infrastructure teams have more options than ever before for running cloud workloads to enable developers to build and deploy modern applications faster than ever before. The rise in container adoption, and adjacent cloud native technologies like Kubernetes, serverless, and on-demand container platforms such as AWS Fargate and Microsoft ACI, presents new security challenges. Cloud native computing truly encompasses a continuum, spanning VMs, containers, serverless, and other emerging technologies. In this webinar, we hope to shine a light on ways security can protect the full cloud native continuum -- with speed to enable devops while providing security depth and control required by today’s enterprises. Service meshes are one of the newest innovations in the world of microservices and cloud-native computing. They’re a critical tool for making microservices applications feasible to implement and manage. At the same time, however, service meshes — like all components of the software stack — must be properly secured. Without sufficient security oversight, service meshes run the risk of becoming a vector for attack into software infrastructure, as well as a compliance liability. In this webinar, learn a helpful model of viewing the different cloud-native technologies as a continuum, to address different scenarios and efficiently choose which combination of technologies work best for running different workloads. The continuum starts with bare metal and VMs on the left, continues into “light” hypervisors (like Canonical’s LXD), and extends into containers and services like AWS Fargate and then, ultimately, serverless. Technologies to the left provide the most isolation and control with the tradeoff of greater management and performance overhead. Those to the right facilitate more agile development and app density with the tradeoff of less control. If you ask DevOps engineers about the benefits of containers and microservices, their responses will center on the agility, modularity, and scalability that microservices-based architectures provide. Security is a crucial and often overlooked advantage of migrating to containers and microservices. Containers allow enterprise to secure applications and environments at a more granular and nuanced level. They also empower enterprises to identify and resolve potential security threats before they disrupt workflows, rather than having to adopt a defensive stance oriented around addressing attacks once they are fully underway. •How your organization can adopt a proactive security stance when it makes the migration to containers. Are you are a Security Expert, DevOps resource, or Dev at a large Enterprise? Do you want to migrate your applications to containers and take them to production? Learn how to avoid some of hurdles that you will you have to overcome in your enterprise. Modern enterprises have fully embraced the practicality of containers in their application development, but some are still lagging when it comes to operationalizing security in their container environments. Join Twistlock Solution Architect Michael Withrow for a presentation and platform demonstration. Since the announcement of AWS Fargate at AWS re:Invent 2018, enterprises have been working with their development and devops teams to explore how this new technology aligns with their application modernization strategy. With this new CaaS platform comes new operational concerns and security threats. With the rapid increase in containers and cloud native applications at the enterprise, security teams and incident responders are continually tasked with new requirements and challenges for detecting and investigating security incidents. In this webinar, Neil Carpenter from Twistlock will discuss what a transition to containers means for incident response teams and how Twistlock can help to ease the pain. Modern enterprises are implementing both the tools and the cultural changes required to embrace a DevSecOps mindset and approach. Join Twistlock Product Marketing Manager Keith Mokris for a presentation and platform demonstration. As more organizations deploy containers across the enterprise, network security needs to become more automated and less dependent on static configurations. However, organizations’ network security practices have often not kept pace with the evolution of cloud native technology, and expertise on network security for containers and microservices is lacking. Companies often rely primarily on static perimeter based defenses and manually defined VLANs which don’t work well in a cloud native environments because there is no reliable perimeter. Join this live panel discussion with experts at DockerCon to learn how containers and microservices can help modernize your IT infrastructure and increase application security. The journey to cloud native can be a winding road, and with more and more organizations starting on this journey, companies are being taken far beyond just simply containerizing applications. Join this live Q&A with John Morello, CTO of Twistlock as he discusses how server-less and container-as-a-service platforms like AWS Fargate are changing how organizations deploy applications - and what this means for security. In late 2017, The National Institute of Standards and Technology (NIST) released Special Publication (SP) 800-190, the Container Security Guide, a set of guidelines for securing container applications and infrastructure. In addition, the session will highlight how organizations can leverage functionality provided by container-focused orchestration and security platforms to automate compliance across the development lifecycle - reducing overall attack surface and delivering comprehensive threat protection. As software eats the world, cloud native tools and methodologies — like containers and devops— are continuously evolving. Organizations that can identify the major trends in this ever-changing landscape and then successfully secure a new cloud native environment will have an advantage in the market. Join Twistlock's VP of Marketing, Josh Thorngren, as he shares the macro trends he’s seeing in the cloud native security space and the extended cloud native ecosystem in 2018. Kubernetes is a leading orchestration tool used by teams large and small to deploy containerized applications. It is also at an ideal point to automate rules that prevent high-risk vulnerabilities and compliance violations don’t enter production environments, and deploy runtime defenses that protect your applications. 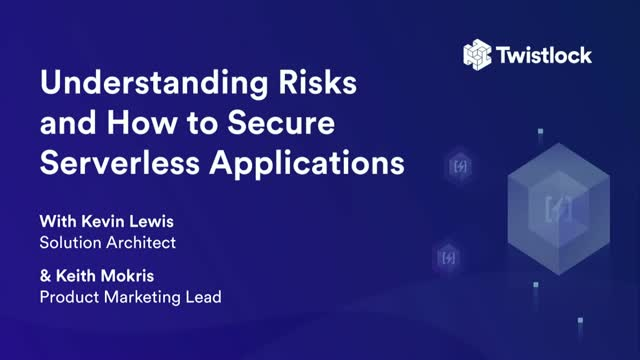 Join Twistlock Solution Architect Kevin Lewis to see how Twistlock integrates directly into Kubernetes to improve your risk and compliance posture without slowing down development. Customers and employees demand easier ways to interact with your organization. At the same time, regulatory requirements like HIPAA and PCI combined with huge amounts of sensitive data raise the stakes around building secure and compliant applications. Increasingly, organizations are looking to containers and microservices to provide the agility and scalability needed to satisfy their customers. But there are other crucial and oft-overlooked advantages of migrating to containers and microservices: Compliance and Security. Containers offer a number of opportunities for building and deploying more secure applications and environments. We’ll look at how containers enable automated security and compliance checks throughout the entire development lifecycle, from the first line of code through to runtime. Open source, containers and microservices, and a myriad of DevOps tools reduce the time and friction to deploy code. Oftentimes, security becomes a limiting factor in bringing new innovations to market. To build secure applications without slowing development cycles requires a new approach to security: Shift-Left Security. This means moving security to left in the development process and into the purview of developers by integrating it into existing workflows. CI/CD tools like Jenkins enable development teams to deliver software faster. To prevent containers with either high-risk vulnerabilities or compliance violations making it to production, it’s important to integrate automated compliance and vulnerability monitoring that can check, alert on and fail builds. By detecting and remediating security risks early, you reduce overall risk, minimize costly rework, and reduce the effort of downstream security checks. Join Twistlock Solution Architect Matthew Barker to see how Twistlock integrates directly into Jenkins to improve your risk and compliance posture without slowing down development. Learn how to securely configure host settings and Docker Engine. Docker allows teams to increase the speed and scale that they can deliver software. As a result, adoption rates for docker are accelerating as more organizations are looking for ways to innovate faster. As you move down the path to containers, it is important to note that an out-of-the box installation of just about any Linux distribution is capable of running the Docker daemon and Docker containers, but it will leave your host exposed to many security and performance concerns if not configured properly. Twistlock CTO, John Morello, describes some of the key functionality in Twistlock's 2.0 release, including Runtime Radar, Compliance Explorer, Certificates, and Secrets management.